The first to file in a divorce case is known as the petitioner and the spouse responding is the respondent. In most divorce cases there is not any choice as to where to file a divorce, however, if you and your spouse are residents of distant counties, for example, a petitioner can file in a courthouse geographically closer to avoid having to be the one who travels the greater distance to court hearings. If you and your spouse are residents of different states, the petitioner will enjoy the divorce laws of the state in which the divorce is filed. Say for example, you reside in Illinois while your soon-to-be-ex resides in another state. 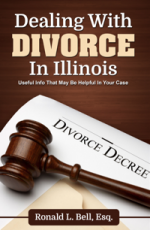 If you file in Illinois, the divorce will be subject to equitable division of property under the laws of Illinois, even if the respondent lives in an equal division state such as California. Previously, Illinois required that couples show grounds for divorce, but no more. With the days of having to prove infidelity or abuse behind us, couples can now divorce each other based on irreconcilable differences alone so there is little incentive to rush and tell your side of the story to put a spouse on the defense. That said, a petitioner will appear in court to state his or her facts first and make a last rebuttal. Although most cases are settled long before a case goes to court, temporary orders hearings where a judge makes orders for issues such as spousal support, child support, visitation and who gets to stay in the family home during the divorce are common. Even though a judge is sworn to look at the merits of a case unprejudiced by the order of argument, some prefer to lay the groundwork for the case by appearing first. Another possible advantage of filing for divorce first is to put orders in place to prevent your spouse from hiding assets or going on a whirlwind shopping spree. The petitioner can seek a temporary restraining order to prohibit this type of behavior after filing. If you are worried that your spouse is squirreling away or squandering marital assets, getting a move on the divorce will likely bring any shenanigans to a screeching halt. Despite the proactive stance a petitioner would seem to enjoy, do not worry if you are unable to file for divorce first because a responding spouse can file an answer and counter petition with the court to maintain their rights. Whether you are the petitioner or respondent, the importance of having an experienced Illinois family law attorney on your side can not be overstated to ensure you get a fair shake. Contact the Illinois family law offices of Ronald L. Bell & Associates PC for immediate assistance today at 847-495-6000.